Unlike much of what goes on inside, the Sussex Masonic Centre on the west side of Queen’s Road is certainly no secret. 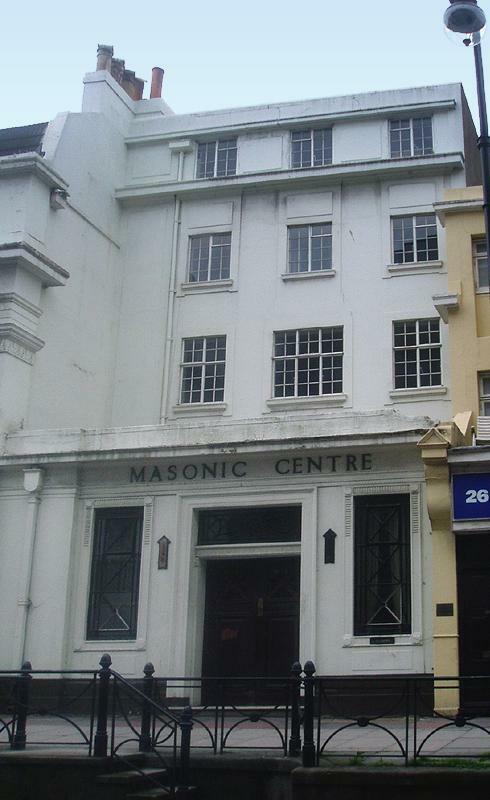 Not to be confused with Freemasons Tavern on Western Road in Hove, the Sussex Masonic Centre is the meeting place of most of Brighton’s Masonic Lodges. The building’s relatively small Regency section is a massively modified 1820s Wilds & Busby house. Amon Wilds and Charles Augustin Busby were the duo behind the massive Kemp Town and Brunswick Town developments. It was donated to the Masons in 1897 by a family of brewers, the Kidds. However, it is the massive steel-framed 1928 Art Deco extension which is of major interest as it includes most of the building’s best bits. The extension is entered to the north of the Regency dwelling and wraps all the way around it. The light green façade of the amalgamated structure offers only a small hint of what lies within though admittedly there is not much left inside from the Regency period. However, the yellow terrazzo floors, solid wooden panelling, brass fittings and extravagant leaded glass – all excellent examples of typical Art Deco features – ensure that the interior is one of Brighton’s finest. Behind the main entrance is an intricate staircase which encases the longest chandelier that I have ever seen – a brass and green glass affair. On the first floor is the largest of the dining rooms and above it is the main Masonic Temple. The Temple features the distinctive chequered floor which is common to Masonic Temples all around the globe. Queen’s Road features several fine buildings but, overall, is a rather wasted opportunity bearing in mind that it is what first greets those who visit Brighton by train. This is due in part to several awful structures on its east side. Interestingly, one of the older and, indeed, beautiful buildings which was demolished was the home to another charitable fraternal club, the Odd Fellows. In true 1960s, it was mercilessly demolished. What a shame! Queen’s Road was originally known as Windsor Terrace and the original Wilds & Busby house was No. 8. Its name was changed in 1850 by Act of Parliament. The Sussex Masonic Centre opens its doors every now and then to the non-Masonic public. To find out how to see this fantastic building for yourself or to discuss Freemasonry generally, call the Centre’s curator, Reg Barrow, on 01273 737404.